We received this fabulous book just in time for spring. 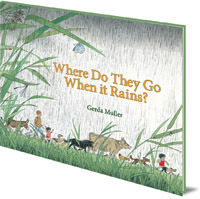 Where do they go when it rains? is written by Gerda Muller. It is the story of twin siblings, Marion and Luke, who live in the city. They meet up with their cousin Stef who lives with their grandmother in the countryside. Stef takes the twins out for a walk to the seaside. On their way, they pass through fields full of flowers, grasshoppers, and bees. They stop at a farm, where they feed the hens, pigs and ponies. Then the clouds turn grey and it starts to rain. The twins love splashing about in the rain ... but where do all the animals go when it rains? As they walk back to home, they observe where the animals go when it rains. The cat jumps in its house at the drop of the rain, the pigs enjoy the mud and splash about. The birds hide under the leaves... A lovely book for your spring basket with lots of details to spot . Now, for the exciting part: I have got three copies of the book to giveaway! To enter: Visit Floris Books and tell me which book you'd love to read. 4.Competition is open to UK entrants. Disclaimer: I received a review copy from the publisher,this review however reflects my honest opinion. The Elsa Boskow picture book collection looks fantastic! The Button book looks cool, but I love Crafts Through the Year! I'd love to read Celtic Wonder Tales: And Other Stories. The Apple Cake looks good. Like activity books so Summer Nature Activities for Children would give me lots of ideas.